Two of the biggest arguments against VDI have been (1) it’s too complicated, and (2) it costs more to buy and implement than just buying traditional desktops. (We had an interesting conversation on BrianMadden. Pano Logic hopes to change the conversation around VDI complexity and capex cost with the announcement of “Pano Express,” a 50-user turnkey VDI system which they’ll sell for USD $24,450 ($489 per desktop). The Pano Express system is completely turnkey, including 50 Pano client devices, an HP server with the horsepower and RAID ready to run the 50 desktops, 50 Microsoft VECD licenses, VMware vSphere Essentials and all the virtual servers and desktop templates ready to go. You can literally be up and running in 20 minutes! I really like that the Pano Express bundle comes with all the VMs you need to be running quickly. You just take one of the 50 Panos out of the box and plug it in, and the wizard comes up automatically (to configure domain authentication, etc.). And I also love that it includes the VECD (well, I guess technically they’re VDA licenses now) and the vSphere stuff you need to get up and running. VMware vSphere Essentials (includes ESXi 4, vCenter Server for Essentials, vCenter Agent & Update Manager licensed for three dual-proc hex-core CPUs and 256GB RAM. You can configure the desktop template to be used for many-to-one, one-to-one based on user, or one-to-one based on device. The whole process is outlined on Pano’s site. So what do you think? Most people no twitter yesterday (when this thing was announced) thought it was cool with the only negative being that there’s no redundancy. (i.e. just one server). Although if redundancy’s important then there’s nothing stopping a customer from buying a second server and adding into the group. Dang! I love it. I have been thinking about the concept of offering an all-inclusive bundle solution and how it would suit SMB customers. PanoLogic delivers! Great job. Unfortunately, just adding a server to this implementation won't cause it to become high availability. Each server is using local storage and there is no method in place to replicate or share the data. For a small business looking for a quick, small and unreliable solution that locks them in, this is great. is this similar to KAVIZA in which Citrix invested recently (except I think Kaviza didn't provide the hardware) ? I wonder what kind of IOPS you can get with something like a Drobo or Buffalo box? Like I wonder whether a $1500 consumer NAS could support the home drives and data for 50 users? I guess probably not. But if I'm a small shop with traditional desktops, I don't have any desktop HA to begin with, so this doesn't really make it any worse. (Except with a failed server you'd lose everyone at once.) But what about a second server and a consumer NAS for nightly backups? I think that'd be pretty solid for what, maybe another $5k? Or actually with two servers you don't even need the NAS. Just some way to replicate the data. And for me I'm fine with that. I mean come on.. these are desktops. The servers have RAID 5.. that's getting a pretty high number of nines without a lot of money.. certainly much higher than whatever the customer had before. For high availability you'd really only need the server hardware (at ~$5,000) - the included VMware vSphere Essentials is licensed for up to 3 servers. You could also setup a Pooled Collection and spread double the number of DVM across both servers (remember the Msft VECD licenses are tied to the devices and not the DVMs). With a pooled collection the DVMs are essentially disposable. Consumer-grade NAS might not be optimal since they likely wouldn't provide the IOPS and low latency needed for running DVMs but they could provide a good place to back them up or as a network share for user profiles and documents stored outside the DVMs. At first glance, the "His and Hers Pano Watches" depicted in the above picture are quite impressive. In reality, the Pano solution, Express or otherwise, is only applicable to low-complexity, limited-user environments. I say this because any solution that utterly dumbs down the client endpoint will ultimately prove to be non-scalable and feature-poor, and just as unmanageable and costly as a traditional PC deployment. 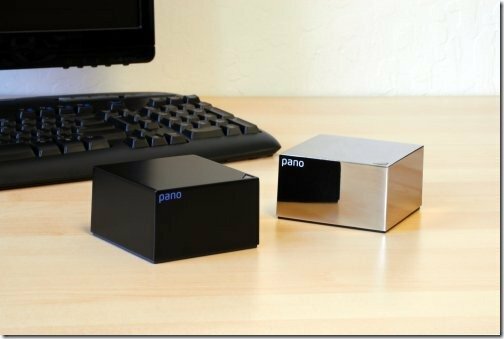 This is the case because Pano is simply the 180-degree diametric opposite of a traditional fat PC. The sweet spot is somewhere in the middle of these two extremes - Not a fat PC, but not a Swiss watch either (no offense to the Swiss). Remote protocols are way too critical to the success and viability of VDI. And then there's printing, device redirection, location awareness, and a whole gamut of optimization technologies requiring local processing capabilities on the client end. But I assume Pano already knows that - And being a low-complexity, limited user LAN solution, Pano has obviously launched their "Express" solution because that's the only niche in which they can really play. Let's recognize Pano's solution for what it is. But if I am to guess, Pano's CTO will soon rush to say how this and that company has already deployed their solution to thousands of users across LANs and WANs. VDI in a box? Not so much. Shouldn't "complete turnkey / everything you need" include keyboard, monitor and mouse? So long as you are prepared, no worries, right? VECD, VDA, and VDI o my! Taking some conversation from customers considering solutions such as the one referenced here. The VECD item referenced in the article is a cost worth considering. For devices hosting Windows OS instances under SA, VECD is no longer a purchase requirement as of July 1st. For these devices you will however be required to purchase VDI Suite Licensing (I love the play on sweet), in the Standard or Premium Suite selection at $23 and $53 per year. So, 50 devices covered under SA with the Standard VDI Suite = $1150 per year, while those choosing the Premium VDI Suite will pay $2650 per year for the same SA covered devices. In the Panalogic instance referenced in this article, and for any other similar approach to VDI (nCompute anyone), the annual costs will also include the Microsoft VDA License (the VECD replacement as of July 1st) at $100 per year per device, plus the additional VDI Suite licensing at the Standard ($23), or Premium ($53) option. So, for the 50 seats referenced above, I do not see the cost of the Standard or Premium VDI Suite, or the annual renewal of the Windows VDA. The year two line item recurs at the rate referenced. I have a bias in these matters. But, does this sort of thing really reference a value proposition for business. The businesses I meet today that are investing in technology are growing. If a business is investing capital in delivering applications to employees, will this sort of product offer a platform that can scale to meet future business need? Underlying costs aside, I have my doubts. does this come with PCoIP? to get dual monitor support with Pano Device you have to buy an additional device namely "Pano Dual Monitor Adapter" that uses the USB slot for the second monitor. It doesn't use DVI either so a converter is needed for DVI monitors. The "his and hers boxes of imported French fragrance" aren't capable of supporting PCoIP. This device is more like a sub-zero thin client far from capable of meeting any sort of requirement verging on the complex. Think of the Pano device as a single-port KVM giving you access to one virtual computer. To be far, Pano offers a Pano-Remote option on a USB key. This is intended for use in conjunction with a Windows-based client over the Internet. This option probably uses RDP to remotely connect to the same desktop that you would other access from inside the LAN using the Pano box. A couple of you had mentioned Kaviza, so I wanted to clarify what we do. With Kaviza, you can deploy full virtual desktops with either Citrix HDX or RDP and built-in high-availability for a total cost per desktop of between $260 and $500. Kaviza VDI-in-a-box is a software-based virtual appliance that automates all the VDI functions - provisioning, load balancing, high-availability, user management and scalability. The architecture is Google-esque and scales on inexpensive commodity hardware with just direct attached storage. Kaviza provides HA using direct attached storage. Total cost per desktop: $225 to $410 per desktop. This assumes the use of a repurposed PC, but you get a complete solution with HA and built-in scalability and complete provisioning automation and the choice of protocols and hypervisors. We have reseller partners who bundle everything into a complete solution if a customer wants that. Hope this helps. You can try it for yourself from our website. As Brian mentioned, cost and complexity are two key factors that hamper VDI. You need to address them but in a way that doesn't compromise high-availability, scalability, vendor agnosticity, while maintaining good user experience even over WANs. At Kaviza we address each of these key concerns. Ours is a SW appliance that costs $260 - $410 per desktop (total cost including MSFT VDA, Server with DAS, cost of Hypervisor) assuming a refurbished PC (which the bulk of the customer base start with). out-of-the box. You don't have to create server pools and create your own infrastrux to duplicate your data etc. The virtual SW appliance does all of this using SW that we have painstakingly developed over several years. BTW, if you have an allergy to using direct attached storage (DAS) our solution will work on SANS as well. As one of the posters above suggested .. we need a middle ground. Something that is simple but doesn't compromise on fundamentals and lock you in. We feel Kaviza is such a solution because you can get it up and running in 2 hours and scale on demand while your users get the benefits of a tried and true protocol, HDX. @Rick....doesn't the Enterprise TS CAL now cover the VDI suite license?